THE linguistic meaning of the root verb, sa∙ba∙ra, is to confine, detain, retain, restrain, restrict or withhold something. Usually, when used in the religious sense, it’s object is the self or soul. As a concept in Islam, sabr is often translated as patience, but it also includes aspects of restraint, self-discipline, steadfastness, firmness, perseverance, endurance and determination – depending on the context in which it is used. Sabr conveys a very active, dynamic, and positive quality in Islam. It is the quality of surging forward, striving, and not slackening in our purpose to purify the soul. It is a strong foundation, the firm lowermost rung of the ladder which holds firm come what may. “When a man’s patience is stronger than his whims and desires, then he is like an angel; but when his whims and desires are stronger than his patience, then he is like a devil. This means that despite what we like and prefer, what Allah wants us to do takes top priority. In obedience to Him is mercy. Our limited minds cannot always comprehend that whatever is given to us is good for us. The trials and difficulties that are destined for us are also good, for they draw us closer to Allah. Three aspects of Sabr have been outlined by scholars for us to comprehend and put into practice. O my son, establish prayer, enjoin what is right, forbid what is wrong and be patient over what befalls you. Indeed, [all] that is of the matters [requiring] determination. 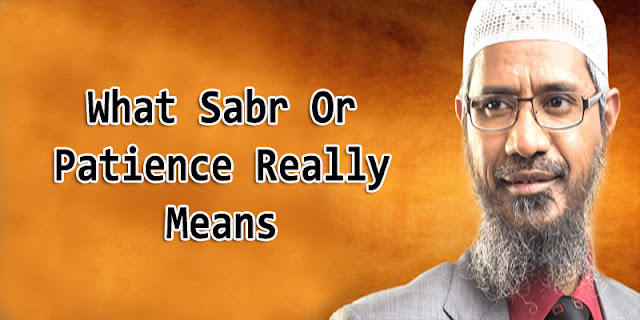 1) Sabr meaning endurance and perseverance, which is required to fulfil the commands of Allah. The directing of oneself toward obedience and worship is of benefit to the soul. Knowing that the soul likes ease, comfort and the company of others, and dislikes being controlled helps us in managing it with full awareness and resolve; for example, to establish prayer under all circumstances of heat and cold, busy work schedules and health constraints. Similarly for zakāh, saum, jihād, as well as understanding and implementing all the concepts outlined in the Qur’an in our lives, a determined effort is required. 2) Sabr meaning restraint, which is required for refraining from what Allah has prohibited and from all kinds of disobedience and sin. Examples of this are pre-marital relations, stealing, cheating, murder, dealings in riba, eating pork, drinking alcohol, backbiting, gossiping, devouring inheritance, not giving rights and injustice in general. Most difficult to overcome among these are the sins that are done secretly and those that others tolerate due to a comfort factor it creates for them. 3) Sabr meaning acceptance of Allah’s decree in our lives, such as the death of a loved one, illness, the loss of wealth or of a job. Lack of strength and resolve for the deen leads to turning away from Allah by giving up prayer and other duties or complaining about Him instead of complaining to Him, as did Prophet Ya’qub: He said, “I only complain of my suffering and my grief to Allah.” And some even abandon the deen by denial of Him. However, sabr is not fatalistic resignation to our difficulties. It is not the belief that, since everything is written, one just has to let time go by – to patiently endure through the unfolding of time. Rather, it is actively tackling life’s problems and difficulties and striving to overcome obstacles. It is making choices purposefully and consciously. These choices will determine the direction of our souls in life and their destination in the Hereafter. The only way to proceed through life is to strengthen that first step which has been long neglected and misunderstood: sabr. We can be disorganized and careless, working in a haphazard manner. Or we might be of those who complain, brood, are bitter, reactive and temperamental. Or we might choose to be emotionally wounded and mentally trapped. Or, on the other hand, we can decide to work toward absorbing all those aspects of sabr in our lives as our Rabb meant us to do – to be accepting of our decrees, make the best of them and convey this knowledge to others. [He] who created death and life to test you [as to] which of you is best in deed. And We will surely test you with something of fear and hunger and a loss of wealth and lives and fruits, but give good tidings to the patient (as-sābireen). And seek help through patience and prayer, and indeed, it is difficult except for the humbly submissive [to Allah]. And be patient, [O Muhammad], and your patience is not but through Allah. Indeed, the patient will be given their reward without account. And Allah loves the steadfast. Ease and comfort do not give strength as difficulties do. Difficulties make us physically and mentally stronger. Too much comfort only weakens us. When we trust in the inherent good of Allah’s decrees, we continually prepare ourselves for the possibility of examination through painful experiences. This helps us to practice sabr. How does one attain sabr? Through willful training and practice. Early scholars observed that one becomes patient by being patient, i.e., by repeatedly practicing patience and forcing it upon himself in difficult circumstances. Sabr is not just a support to lean on. It is that strength which makes us stand firm against all odds with mind focused and heart striving with faith and trust in Allah – accepting His decrees, His plan for our lives – fully aware that He is the Owner of the universe and that His knowledge of good for us and His justice are unquestionable, infallible and complete.